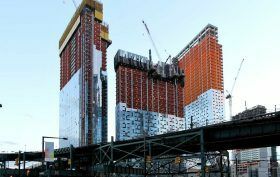 As the Long Island City skyline continues to grow, so does the list of amenities developments are offering residents in the booming Queens neighborhood. New renderings of the massive, three-tower, 1,871-unit rental complex, Jackson Park, reveal extravagant luxuries like two swimming pools, a gaming area, a full-size basketball/volleyball and squash court, and much more, as the New York Post reported. 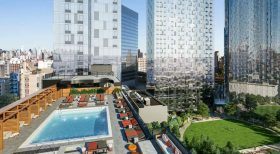 With move-ins expected in January, leasing has officially begun at the Tishman Speyer-complex, with net rents starting at $1,915 per month studios, $2,335 per month one-bedrooms, $3,555 per month for two-bedrooms, $4,745 per month for three-bedrooms and $7,310 per month for four-bedrooms. 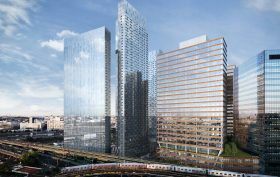 Of the 30+ under-construction and proposed projects in Long Island City, many of the tallest and bulkiest are located near Queens Plaza, including this trio of slab-glass rental towers from Tishman Speyer and H&R Real Estate Investment Trust that will bring nearly 1,800 new apartments to the area. The residential buildings–located at 28-34 Jackson Avenue, 28-10 Jackson Avenue and 30-02 Queens Boulevard–are directly adjacent to Tishman’s two-towered commercial venture that will be home to WeWork, Macy’s, and a food hall. CityRealty recently stopped by the construction to see how things are shaping up at the rentals, which from the looks of it are well on their way to welcoming in LIC’s newest batch of residents. There are currently nearly 30 under-construction and proposed projects in Long Island City, which, as 6sqft recently described “is sprouting a small city worth of skyscrapers, ushering in thousands of new residents, hundreds of hotel rooms, and a few hundred thousand square feet of office space.” Two big-time projects come from Tishman Speyer Properties, who are erecting a trio of slab residential towers that will together usher in 1,900 new apartments. In a Wall Street Journal piece today, we get a first look at this glassy consortium, along with new details about the developer’s adjacent two-towered commercial project that will be home to WeWork, Macy’s, and yet another food hall.